Big data is influencing just about every industry and area of government. Women in Data Science (WiDS), a conference made up of many satellite events in cities around the world, seeks to bring gender balance to data science research that is making a global impact. First held at Stanford University in 2015, WiDS 2018 has spread to more than 100 events in 50 countries. 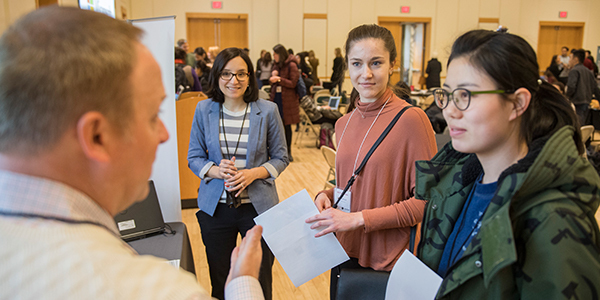 It came to Pittsburgh for the first time in March, held on Carnegie Mellon University’s campus and hosted by the Dietrich College of Humanities and Sciences’ Department of Statistics and Data Science. “It is fitting that this event falls a day after International Women’s Day and gives us the opportunity to acknowledge women’s many, remarkable contributions, particularly towards helping us all better understand and analyze data to solve important problems,” said Christopher Genovese, head of the Statistics and Data Science Department, during a welcome address. Both men and women participated, but all of the conference speakers were women. Marlene Behrmann, the Cowan University Professor of Cognitive Neuroscience and the first—and to-date only—female scientist from CMU inducted into the National Academy of Sciences, gave the opening keynote on her brain research in the pursuit to find a biomarker for autism. CMU’s Amelia Haviland, the Anna Loomis McCandless Professor of Statistics and Public Policy in the Heinz College, delivered the closing keynote on analytics for social good. Several technical talks completed the morning and afternoon sessions. Attendees mingled with employers and various data science groups at lunch. 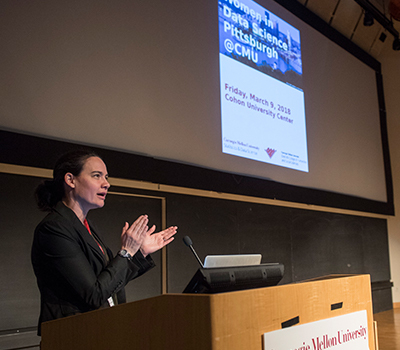 “CMU reached out to us to participate beyond the role of recruiter by bringing our female employees who could talk to what they do for our company,” said Larry Kushnir, vice president of global strategic pricing at Thermo Fisher Scientific. Kushnir leads data analytics for the biotech giant, where his group of 45 is growing as they push to innovate in data science and apply it across areas of the company, from business processes to product development. Two female data analysts on his team spoke with students. CMU’s Data Science Club founding member Sarah Shy, a senior majoring in statistics and human-computer interaction, sought to recruit members. She said the club attracts students at all levels of experience and a variety of majors. “We wanted to form a club that would allow us to launch projects, analyze data together and gain some hands on experience. We also hosts talks on data science with speakers from within and outside of CMU,” Shy said. Oakland Catholic High School sent members of its all-girl Data Jam club with math teacher Sarah Carvellas, who helped to start the club three years ago. Their technical poster compared crime rates in Allegheny County to the occurrence of pop, rock and country music concerts. "I’m excited about the developing technology ecosystem in Pittsburgh but there have not been that many data science conferences in Pittsburgh. This is a good, impressive event that feels less like a national conference and more like a friendly meet up,” said Evan Wright, principal data scientist for cybersecurity firm Anamoli and a CMU Information Networking Institute alumnus. Organizer Rebecca Nugent spearheaded the Pittsburgh conference on short notice after realizing the region lacked a local organizer. CMU’s Women in Statistics stepped up to help make the inaugural event a success, specifically Shannon Gallagher, Kayla Frisoli, and Amanda Luby, three doctoral candidates who received a CMU ProSeed/Crosswalk grant to support mentoring initiatives in statistics. 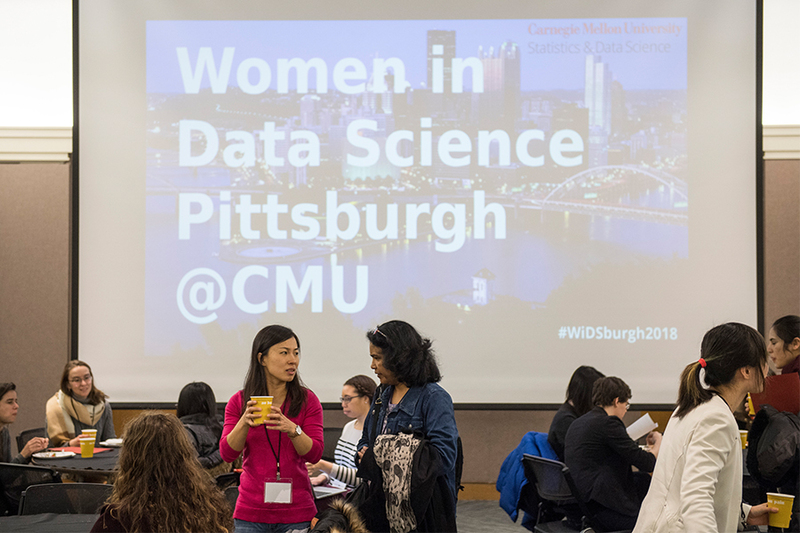 "We initially thought that WiDS was an excellent opportunity to highlight the incredibly diverse data science problems being tackled in the CMU and Pittsburgh communities, but our biggest takeaway from the event was how connected we all are through data science. Given our short time frame this year, it was wonderful to see how quickly everyone jumped on board. We can’t wait for next year," said Nugent, who is associate department head and director of undergraduate studies in statistics and data science. In just six weeks, the conference took on a life of its own. Numerous companies and individuals in the region participated in the event. Sponsors included Bloomberg, Microsoft, Mylan, Thermo Fisher Scientific, Uber ATG and the Dietrich College. Groups from across CMU participated showing the multi-disciplinary influence of data science, including CMU’s Libraries, Electrical and Computer Engineering, Heinz College, Information Networking Institute, Integrated Innovation Institute, School of Computer Science, Software Engineering Institute and Women@SCS. “If data science were a country, Pittsburgh would be the capital,” Nugent said. Top photo: The conference offered many networking opportunities. Second photo: Larry Kushnir, a vice president at Thermo Fisher Scientific, talks with attendees about data scientist positions on his team. Bottom photo: CMU’s Rebecca Nugent kicked off the day with a welcome address.